Nigerian police are hunting for three teenage girls abducted from their boarding school on the outskirts of Lagos city by heavily armed men. Kidnappings for ransom occasionally occur in Nigeria's commercial capital, but this is the first time a school in the city has been attacked by gunmen. The girls were taken from a private co-educational secondary school on Monday evening. 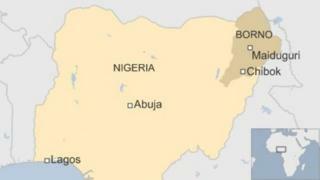 In most kidnapping cases in southern Nigeria, hostages are released unharmed after a ransom has been paid, reports the BBC's Umar Shehu Elleman from Lagos. It is nearly two years since more than 200 girls were kidnapped from a boarding school in the north-eastern town of Chibok by militant fighters behind the Islamist insurgency in that region. Despite military advances against the Boko Haram group over the past year, the Chibok girls have yet to be found. Lagos police spokesperson Dolapo Badmus told the BBC a search to rescue the girls taken from the Babington Macaulay Junior Seminary School was under way. From local media reports it is not clear whether the girls were kidnapped from their dormitory or in a nearby block where they were studying. Some witnesses reported that shots were fired, making it hard for the unarmed security guards to intervene. Our reporter says the school, linked to the Anglican Church, is one of the best and most expensive in Lagos state and is mostly attended by children of politicians and wealthy individuals. Some angry parents have reportedly withdrawn their children from the school until security is improved.